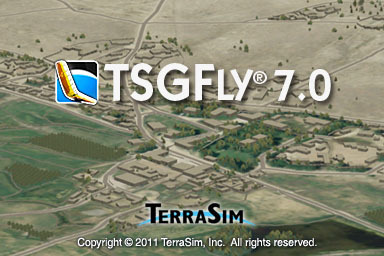 TSGFly is an advanced 3D viewer for Tiled Scene Graph (TSG) databases by TerraTools®, TerraSim's state of the art geospatial visualization software. The TSGFly viewer provides a real-time viewing environment for inspecting and demonstrating visualizations created in TerraTools. TSGFly is freely distributable, allowing database developers to easily deliver their TerraTools visualizations to their clients and customers. Navigation controls are easy to learn, with advanced capabilities available for experienced users. TerraTools divides its visualizations into multiple data tiles that TSGFly efficiently pages into the necessary viewing area, providing high-performance 3D visualizations without expensive graphics hardware under Windows XP, Vista, and 7. The basic movement controls in TSGFly allow the viewer to freely navigate the visualization in real-time. TSGFly also has many capabilities that simplify the navigation process. Points of interest and flight paths can be dynamically created and modified within the TSGFly viewer. Exact coordinate locations can be selected and viewed in several different coordinate systems. Together, these controls combine to allow easy and flexible navigation for all users.